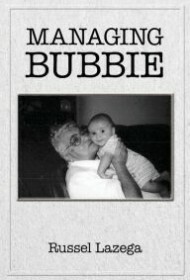 In Managing Bubbie we meet an unforgettable character through the eyes of her grandson, Russel Lazega, a Miami Beach lawyer who paints a portrait of this remarkable, unconventional Holocaust survivor and skilled noodge. Now in her declining years, Bubbie Lea and her “take-charge personality” need some managing, but Lazega realizes that it may not be easy helping the strong-willed matriarch make necessary life changes. Lazega brings Bubbie to life with humor and love through side-splitting comedic dialogue and a powerful historical narrative accompanied with letters illuminating Lea’s struggle raising a family in Hitler’s Europe. Her improbable, hair-raising escape from Poland via Belgium, France and Spain illustrates the resourcefulness, derring-do, and sheer chutzpah of a woman who delivered her family to safety. The author re-creates the good-humored teasing he throws at Bubbie (much of which goes over her gray head) with vaudevillian timing and the comedic dialogue is written with a musical Jewish accent. Personal photographs clarify her confusing family tree and Brooklyn/Miami mishpocah (family). While the Jewish humor may seem clichéd, with jokes about overcooked food, matchmaking and suffering, the narrative has a Jewish folk charm full of irony and miracle. The contrast between the elderly, quiz-show-watching Americanized Bubbie and the unconquerable, heroic younger Lea disappears by book’s end, when an ailing but stubborn Bubbie promises Russel from her hospital bed that she’ll survive: “Look, I’m still here. I’ll manage.” No one manages Bubbie, Russel realizes, because she always manages. Part interfering yenta, part philosopher, part drama queen, Bubbie pontificates on life, guiding her extended family in America. She is aggravating, but Lazega shows she’s entitled. Her escapes from several nursing homes are evidence that Bubbie remains a tough, independent customer whose refusal to follow orders once helped her survive. In the uncompromising, larger-than-life Bubbie, her family has their hands — as well as their hearts — full. Her stirring story is one that should be widely shared.